A safe construction company equals a safe job. Safe jobs keeps workers and clients healthy, but it also means a partnership that costs less and gets finished on time. We have learned how to work safely and productively through our decades of experience. Colacurcio Brothers has been a member of the AGC’s Safety Team over 13 years and we’ve consistently had one of the lowest EMR’s in the industry. But we also don’t take our record for granted; we establish a site-specific safety program for every job we work on, which is communicated to every worker, subcontractor and supplier onsite. 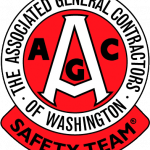 We are proud members of the Associated General Contractors of Washington Safety Team for over 13 years and continually strive to educate ourselves on the best safety standards. Interested in working for Colacurcio Brothers? Check out our careers page for opportunities. For projects, inquiries, and proposals, please contact us for more information.